Poi E has recently reentered the charts, thanks to its inclusion in Taika Waititi’s rather good film Boy, and his new video for the song. But I’m rather fond of the original video. In fact, I’d say that the video for the Patea Maori Club’s 1984 number one single is almost as famous as the song itself. It has a simple structure: first verse and chorus – down on the marae; second verse – down by the Aotea canoe; second chorus – out on the streets of Patea; funky break down – the big city; final choruses – back in the Patea hall. But within these few locations, there are little visual gems that make this video a treat. Here are my ten favourite bits from the original Poi E video. 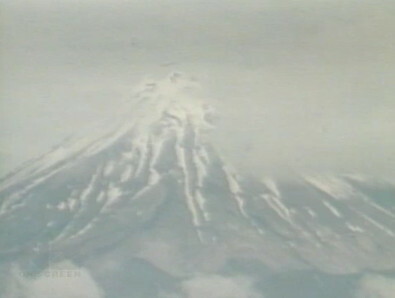 The video opens with an upwards pan over this image of Mt Taranaki. It’s later shown to be a mural painted at the back of local hall, but with this slightly grainy footage, if you squint it almost looks like Mt Taranaki on a misty morning. Interestingly, when Poi E was released, the official name of this volcano was Mt Egmont. It would be two more years before Mt Taranaki got equal name status. I like to think the Patea Maori Club had a little to do with that. 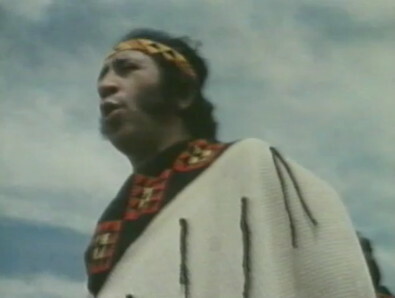 The first section of the video is the Patea Maori Club performing Poi E in front of a whare nui. 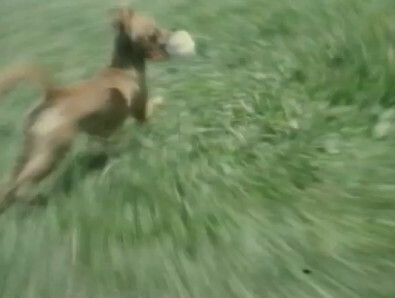 This could lead to a disastrously boring video – like “Sailing Away” two years later – but the Poi E video mixes it up by including footage of this crazy dog running around with a poi in its mouth. Did the dog steal the poi or was he the club’s special kuri performer? Look at those mutton chops. Just look at them. Now, this video was made in 1984. Mutton chops were at their fashion peak in the mid-’70s. Yet this fellow has lovingly held on to his unfashionable facial hair. In fact, it looks like a bit of a ’70s shag do lurking underneath that headband. He has his look and he’s not changing for anyone. I love this kid because he’s really enjoying himself. While the rest of the kids look like they’re just there to participate in the filming of the music video, this dude looks like he’s there because he loves the song. Standing tall and proud and really digging the music. Nice one, little fellow. I think this was a happy accident. 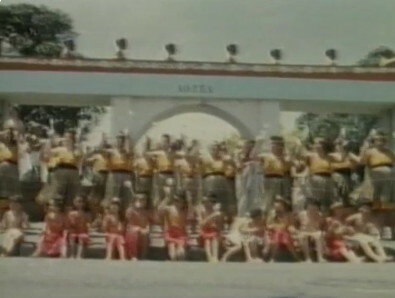 At this point in the video, the group are standing in front of the concrete canoe, but trucks keep thundering past, ruining the shot. 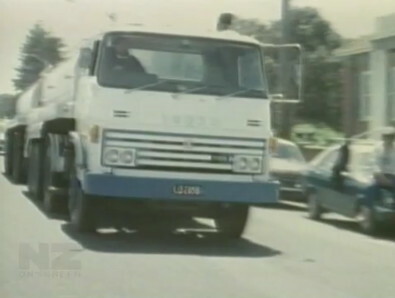 But the film-makers cleverly incorporate the trucks into the video. Here comes a milk truck, and a bit later there’s a cattle truck. Hey, this is what life is like in Patea. This isn’t actually a hidden delight of the video. No, this concrete waka is one of the main stars of the vid. It’s a slightly kitschy design, but has come to be an icon of Patea. It commemorates the Aotea canoe that brought the first Maori to the Taranaki. This takes the PMC out of the traditional marae setting and puts them firmly in a what can only be a small New Zealand town. The action moves to Manners Mall, Wellington. 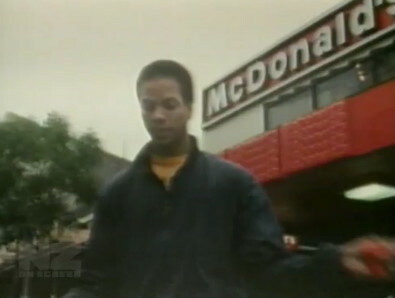 And when it’s the mid-1980s and you’re from a small town, what symbolises the big city? McDonald’s. It’s cool, it’s urban and the outside of the building has “McDonald’s” embossed in plastic. I bet they all had Big Macs after filming was complete. Look how happy she is! Arms reaching out as if to hug the world. Every performer wants this sort of reaction from the audience. Absolute genuine adulation and appreciation. She doesn’t care about the music video shoot either. She just want to dance along to her favourite band. We’re back at the local hall for the finale, then suddenly these two truly outrageous ladies show up. The hair, the eyeliner, the off-the-shoulder top, the jewellery, the pout – just what are these two new wave babes doing in a Patea Maori Club video? I’m not sure, but it is a nice nod to the sort of other culture the PMC were up against in the pop charts. The new wave chicks can’t keep a straight face for long. The camera zooms out to reveal this fellow who we shall call Poi George. A Maori fulla with Boy-George-style plaits and non-Boy-George-style poi. I don’t even know where all this action is taking place in relation to the rest of the video, but this is my absolute favourite bit of the video. They knew exactly what they were doing – they knew they were making a video for a song that was going to be a hit.